My love for Italy started in college. The story behind this is another blog entry which I will discuss next time. But for now, I will focus on one of my favorite Italian food – il gelato! What makes gelato different? 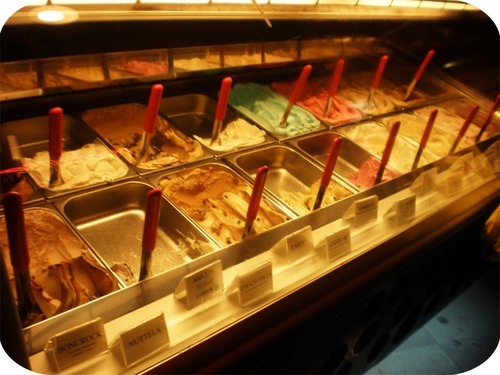 Gelato is lower in fat but higher in sugar content. Also, gelato has more intense flavor. 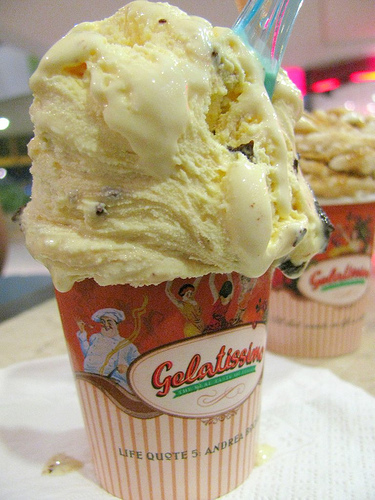 Throughout Metro Manila, there are only two stores claiming to serve “authentic italian gelato”. Well, I wouldn’t really know an authentic gelato since I haven’t been to Italy. So taking these stores’ word, I tried Gelatone and the newly-opened Gelatissimo Café. Both are located in Greenbelt Ayala Center. Gelatone has been around for quite sometime and for the longest time, it is the sole gelato store (as far as I am concerned) in the metro. I love the creaminess of their gelatone and the intense flavor. My favorite flavors are Pistacchio, Roke, Straciatella and Amarena. When I first tried the gelato, I noticed its soft texture. From then on, I kept on coming back to try out other flavors. Recently, I had a chance to try out a new gelato store – Gelatissimo Café. They also offer gelato and this makes them the second store offering Italian gelato. Gelatissimo’s gelato is a bit rough compared to Gelatone. But I liked how the gelato’s taste melts away from your mouth. It makes me crave for more spoons of gelato. Gelatissimo has more flavors compared to Gelatone. I think this is a marketing strategy to find out which flavors are marketable. Gelatone’s flavors have been tried and tested throughout the years so what you see now are the best-sellers; however, they introduce new flavors from time to time. Gelatone’s atmosphere is your typical ice cream parlor – small, quiet and laid-back. Gelatissimo, on the other hand, is more on the café-ish ambiance – think of Starbucks and other coffee shops. In terms of pricing, Gelatone is a bit more expensive. A scoop from Gelatone costs Php 100. Gelatissimo offers Php 110 per scoop but you can get three scoops for only Php 190, which brings down cost per scoop to Php 65. My verdict? I love both stores. For now, I will enjoy Gelatissimo because it’s new. But I still like to go back to Gelatone for my dose of Roke.